Literally speaking, a microscope is a tool that lets the user see objects at a magnification greater than the actual specimen. The most common type of microscope is a magnifying glass, which uses a ground lens to focus the light reflecting off an object into a larger image. More complex light microscopes use a series of lenses to further magnify the object. However, conventional light microscopes have a resolution limit of approximately 250 nanometers (1 nanometer = 1 × 10-9 meter), approximately the wavelength of the incoming light used to illuminate the sample. This means that features on the sample smaller than this distance cannot be differentiated from each other. In order to see smaller details, a microscope that uses an illumination source with a smaller wavelength is needed. High voltage electrons are the most commonly used source, although x-rays and neutrons can theoretically be used as well. There are two common types of electron microscopes: scanning (SEM) and transmission (TEM). When using an SEM, bulk biological samples are first coated with a metal that readily reflects electrons. This coating also provides a conducting surface for electrons to avoid charging of the sample. The incoming electron beam is condensed into a small beam which is scanned over the object. An image is formed by the electrons that bounce off the surface of the specimen and are then collected onto the imaging screen. The observer therefore sees a picture of the surface of the sample, without any internal information. A TEM, on the other hand, produces an image that is a projection of the entire object, including the surface and the internal structures. The incoming electron beam interacts with the sample as it passes through the entire thickness of the sample. Therefore, objects with different internal structures can be differentiated because they give different projections. However, the projection is of necessity two-dimensional against the viewscreen and relations in the z-axis between structures are lost. Furthermore, the samples need to be thin, or they will absorb too much of the electron beam. In a sense, a transmission electron microscope works in much the same way as an optical microscope. At the top of the column, there is a high voltage electron emitter that generates a beam of electrons that travel down the column. These electrons pass through the sample and a series of magnifying magnetic lenses, to where they're ultimately focused at the viewing screen at the bottom of the column. Different lenses can be used to change the magnification and focal point of the image. Apertures along the column can be used to change the contrast and resolution of the image. The column itself is at a very high vacuum to minimize interactions between the electron beam and air molecules. Following are the principal parts of a TEM. Electrons are emitted from a wire that has been superheated by an electric current until enough energy (~2500K) is produced to overcome the work function of the metal, usually tungsten or lanthanum hexaboride (LaB6). The emmitted electrons have a Boltzman energy distribution and need to be collated into a tight beam and sent down the microscope column, across the sample, lenses, and apertures. Thermionic and field emission guns (FEG) are the two most common electron guns used. Electron lenses are magnetic coils that have been tuned to focus and direct a passing electron beam. Because the lenses are tuned for one particular electron wavelength, they will bend electrons of other wavelengths less evenly. Therefore, there is a splitting of the electron beam as it passes through the lens. This chromatic aberration effect is not unlike the splitting of sunlight into a rainbow by a prism. In the case of a prism, light of different wavelengths are refracted to different angles as they pass through the prism. Lenses can also rotate the electron beam if they are not tuned correctly. When this happens, the image can rotationally jump as different lesnes are inserted. Three primary lenses are used to form and magnify an image. 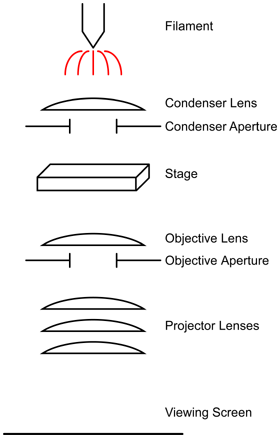 The objective lens is the topmost lens and does the first step of image magnification and focusing. It also works in conjunction with the objective aperture to generate amplitude contrast. The next lens is the intermediate lens and its positioning and strength controls the magnification of the image or the diffraction pattern. 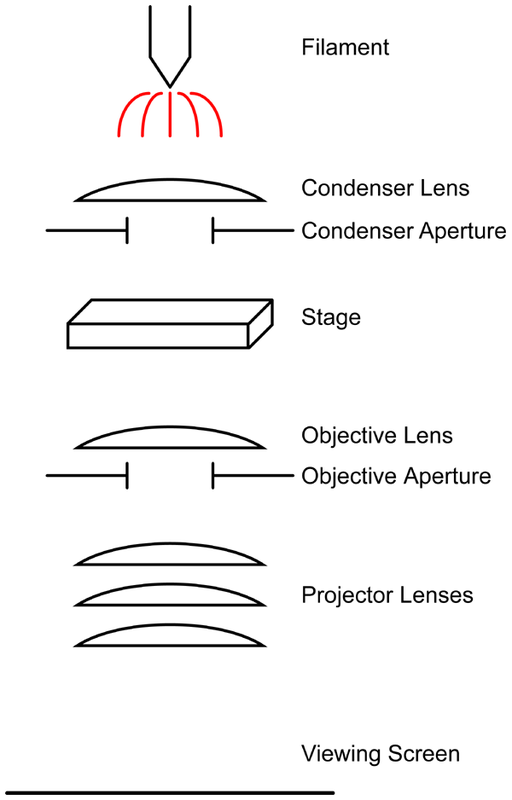 The last lens is the projector lens used to focus and project the image onto the imaging surface. Apertures are holes along the microscope column that can limit the size of the electron beam that passes through it. Depending on it's location in the column an aperture can have different uses. The first aperture, the condenser aperture, for example, is located near the top of the column and as the name implies, is used to condense and mantain the coherence of the electron beam. The second aperture, the objective aperture, is located below the sample just after the objective lens. The objective aperture is used primarily to control contrast in the image. See below for a more thorough description of amplitude contrast. The outside of the microscope is just as important as the inner machinery. A typical user console consists of an informational screen and various control surfaces. These knobs, buttons, and switches can be used to control sample movement, beam brightness, beam current, alignment, focusing, and magnification, among other things. 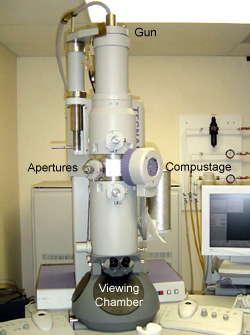 The screen generally displays pertinent information on the functioning of the microscope, such as the current magnification, beam strength, defocus value, beam voltage, etc. Older microscopes use CRTs, but newer models are now interfacing with PCs to allow greater flexibility and control. The sample grid is placed in a metal wand that is part of the goniometer or compustage. In Figure 1, to the left of the compustage are the three control knobs for the three apertures. The tall white cylinder to the right and a bit behind the column is a cryo dewar that holds liquid nitrogen, used to cool down the column for easier removal of water vapor. The two control pads, used to move the sample and beam are seen at the far bottom of the image. To the right edge of the image is the computer monitor that displays the microscope control software. In older microscopes, these controls were often mechanical knobs and buttons. Newer microscopes use a computer interface to directly access microscope functions. When tilt microscopy is needed, it is the goniometer that rotates to change the angle of the sample. In the model shown in Figure 1, the holder has been inserted into the goniometer. The large black casing on the holder is used for storing liquid nitrogen to keep the sample cold. In normal use, there can be control wires attached to the goniometer/holder assembly that monitor the temperature for better performance.